Joe is a criminal defense attorney who represents clients in State and Federal court at both the trial and appellate levels. He has successfully defended clients charged with felonies and misdemeanors including drug possession and trafficking offenses, theft, status and firearm allegations, violent crimes, DWI, and traffic violations. Joe also maintains a business law practice representing the needs of North Carolina employers and entrepreneurs. Previously, he worked with a civil litigation firm focusing on the defense of general liability, workers’ compensation, and commercial matters. In addition to being admitted to practice in all State and Federal District Courts in North Carolina, Joe has successfully represented clients before a variety of administrative bodies and professional licensing boards including the United States Department of Labor, the North Carolina Industrial Commission, the North Carolina Code Qualifications Board, and at public university hearings. A graduate of the University of Mississippi School of Law, Joe served as Chairman of the Ole Miss Moot Court Board where he was a member of the National Moot Court team and received honors for written and oral advocacy. Upon graduation, he was inducted into the Order of the Barristers. He received his undergraduate degree in Government and International Policy from George Mason University where he was a four year student-athlete and captain of the Swimming & Diving team. 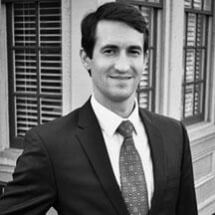 Joe served as a judicial intern for Justice Paul M. Newby of the Supreme Court of North Carolina. He is a certified Blackstone Fellow, following successful completion of the Blackstone Legal Fellowship, conducted by the Alliance Defending Freedom. Joe is a member of the North Carolina Bar Association, the Wake County Bar Association, the North Carolina Advocates for Justice, and gratefully serves on the Board of Directors and as General Counsel for Love INC of Raleigh. Not guilty verdicts following jury and bench trials for clients charged with DWIs, drug offenses, and assault charges. Achieved acquittals and civil awards for clients charged with criminal conduct or facing government suppression of constitutionally protected free speech. Negotiated numerous voluntary dismissals of criminal charges based on insufficiency of the prosecution's evidence or law enforcement error. Won numerous court dismissals of criminal charges following a challenge to the sufficiency of the State's evidence. Collectively saved North Carolina business owners more than one million dollars in civil penalties and administrative fines sought by North Carolina State agencies.